WASHINGTON (Oct. 12, 2012) -- Soldiers with the 911th Engineer Company (Technical Rescue) dug through the rubble of a collapsed building in Washington, D.C., Oct. 11, as part of the "Capital Shield 13" regional training exercise. Soldiers met for their portion of the exercise at a training center for the Washington, D.C., fire department -- in a remote area of the District that a Job Corps center, a police recruiting facility, and an 85,000-square-foot greenhouse used in part to grow flowers for placement around the U.S. Capitol complex. Sgt. 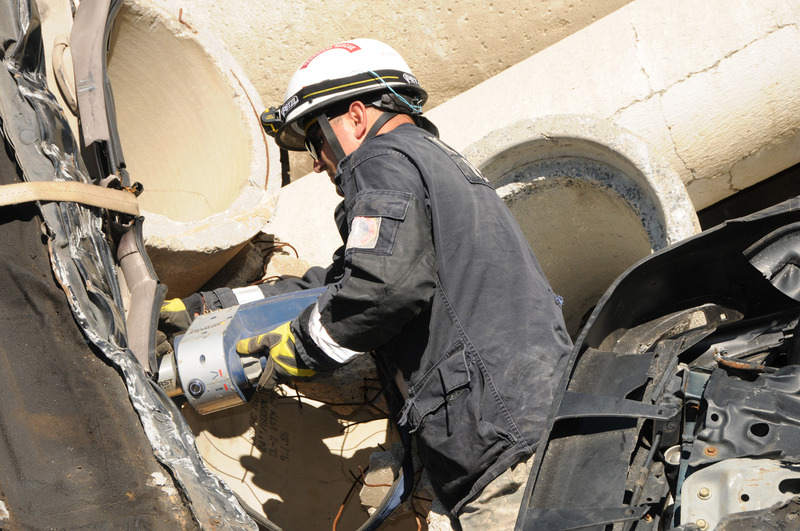 Joshua Murphy, part of the 911th Engineer Company (Technical Rescue) cuts through the rubble of a collapsed building in Washington, D.C., Oct. 11, 2012, as part of the "Capital Shield 13" regional training exercise. During the exercise, Soldiers at the facility crawled over a pile of concrete blocks and wall pieces, wrecked cars, and cement culverts in an effort to find a way to penetrate the mess to locate "victims" buried inside. The rubble pile was meant to simulate a collapsed hotel, said 1st Lt. Matthew Hoover, executive officer with the 911th. "A terrorist explosion has taken place -- so we are here as a civil-support entity to assist in the rescue of the victims in that hotel," he said. Inside were an unknown number of rescue dummies, and a few live role players. Soldiers with the 911th used their specialized technical rescue skills to find a path to those victims. They used saws to cut cement out of the way, or to cut through an automobile, and plasma torches to cut especially difficult steel panels that blocked their path. A culvert system in place in the carefully constructed pile of rubble simulated the voids that would exist in a real building collapse -- such as what might happen if a real hotel collapsed, or the Capitol Building. Blocking Soldier movement through the passageways were chunks of steel and concrete that have to be removed or cut away to allow passage to victims. "It is simulating a tight space they have to crawl through in order to make progress into the building," Hoover said. "The chances of them finding an obstacle they can't pass is high. They radio back to get the tools needed, and send a team in to deliver the tools to them, or send a team in with the tools to take their place." Clearing a path through the rubble means that rescuers with the 911th can get to those trapped and get them to safety, or go in and look for even more victims. "If we get this open well enough, the dog can actually go through the tunnel system and find where people are," said Spc. Nels Parvi, an Army-trained firefighter who has been with the 911th for a year and a half now. Hoover said Soldiers with the 911th train at their home station on nearby Fort Belvoir, Va., using facilities similar to what they exercised on in the Anacostia area of Washington, D.C., including a rubble pile that is nearly twice as large, and a plywood building of tunnels and restriction points they call the "rat maze." But bringing the training to Washington, D.C., as part of Capital Shield, means that the Soldiers can work with civilian first responders and other military units so they can train under the different types of command and control they would experience in a real-world situation, such as a disaster in the nation's capital. "Any time that we go into a site, there is little to no chance that's it's just going to be just us on that site," he said. Normally, he said, such a scenario would be run by somebody like the Federal Emergency Management Agency, known as FEMA, for instance. And once on scene, they expect to work with other federal and local disaster-response teams as well. The Capital Shield exercise gives them a chance to train the way they will operate if they are called on to respond. Lt. Col. Reed Erickson serves as commander of the 12th Aviation Battalion, of which the 911th is a part. He said the exercise is validation of what the Soldiers train for all year. "They train throughout the year on individual- and Soldier-level tasks and things they need to make them successful at this level: basic rescue tasks, combat lifesaver training, EMT training, and basic Soldier tasks. They build on that into squad- and platoon-level collective tasks, through various exercises," he said. "This is really their capstone to validate that whole training plan throughout the year." About 60 Soldiers from the 911th came to the training facility in Washington, D.C., for this part of Capital Shield 13. The exercise runs four days, Oct. 9-12, and involves dozens of Department of Defense military units, federal agencies, and civilian first-responder teams from nearby municipalities. Capital Shield is designed to exercise and test the ability of the services, federal and local agencies to work together. This is the eighth iteration of the Capital Shield exercise, which is conducted by Joint Force Headquarters-National Capital Region/Military District of Washington.